March 2019 was an unprecedentedly busy month for British MPs, as you focus on a matter of paramount importance in British politics - Brexit. It is also a very busy month for China, as the very important political event was held – the annual "Two Sessions". The "Two Sessions" refer to the annual meetings of the National People's Congress, or NPC and the National Committee of the Chinese People's Political Consultative Conference, known as CPPCC. Close to 3,000 NPC deputies and more than 2,000 CPPCC members gathered in Beijing to discuss major issues and make plans for the future of the country. 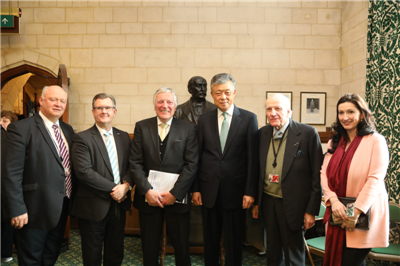 Chairman Graham and Lord Clement-Jones asked me to give a briefing on the "Two Sessions". So let me share with you my views on the "two Sessions", especially on China's future development by answering three questions. First, how is China's economic prospect? This is a hot topic. Some people think China's economy is slowing down and blame this for problems elsewhere; Others believe that China's economy remains an opportunity. First, China's economy continues to perform strongly. China's medium-to-high speed growth rate in recent years is on top of a very large base figure. In 2018, China continued to be the world's second largest economy, with its total GDP reaching 13.6 trillion US dollars. Its growth rate of 6.6% continued to be the fastest among the world's top five economies and its GDP increment was roughly the total GDP of Australia. China continues to be the world's largest trader in goods. In 2018, China's total trade in goods exceeded 30 trillion RMB yuan for the first time (that is the equivalent of 4.6 trillion US dollars). It also represented an increase of 12.6% over the previous year. The net increment was over 510 billion US dollars, larger than China's trade total of 2001, the first year of China's membership in the WTO. China remains the most attractive FDI destination among developing economies. Despite a steep drop in global FDI in 2018, foreign investment flowing into China totaled 135 billion US dollars, increasing by 3%. At the "Two Sessions" this year, China set its growth target at 6% to 6.5%, which would probably remain the fastest among major economies in the world. Second, China's growth continues to demonstrate higher efficiency. First, growth model is optimised. Consumption is playing a bigger role in driving economic growth. In 2018, consumption expenditure contributed 76.2% to economic growth, increasing by 18.6 percentage points over the previous year. Second, economic structure keeps upgrading. With the tertiary industry accounting for 52.2% of GDP, service sector is increasingly becoming a stabiliser in economic growth. Third, new driving forces are gaining momentum rapidly. The "internet plus" strategy has boosted the development of emerging industries and accelerated the transformation of traditional industries. On-line retail sales increased by over 20%. On November 11th, 2018 - the on-line shopping festival known as "Double Eleven" - the total sale hit a record of over 30 billion US dollars in a single day. That was equivalent to the total GDP of Latvia in 2018. With economic growth comes better life for the Chinese people, and greater sense of individual achievement and happiness. Energy consumption per unit GDP fell by 3.1%. "Clean water, green mountains, blue sky and white cloud" are no longer a luxury. Third, China continues to increase its contribution to global economy. In 2018, China's economy contributed close to 30% of world economic growth and continued to be the "main engine" of world economic growth after more than ten years in a row. At the same time, China's foreign trade is more balanced. The surplus has been dropping by 18.3% year on year. Take China-UK trade for example. In 2018, China reports 6.9% increase of import from the UK, while the British statistics is even higher, at 30%. According to WTO statistics of the first three quarters of 2018, China's share of global import grew by 0.7 percentage points to 10.9%, and China's contribution to the growth of global import was 16.8%. China is also a main contributor to global poverty alleviation. According to the statistics of the World Bank, for every 10 people lifted out of poverty, 7 are in China. China plans to eradicate absolute poverty by 2020. That would be ten years ahead of the scheduled goal set out in the 2030 Agenda for Sustainable Development of the United Nations. How China manages to accomplish this will provide useful experience to other countries as they strive to reduce poverty. Now let me come to the second question: Where is China's reform and opening up going? The year 2018 marked the 40th anniversary of China's reform and opening up. This great cause is now faced with increasingly severe challenges. Against these challenges, the "Two Sessions" sends a clear message again that China will stay committed to the basic policy of reform and opening up. First, China will take on the most difficult issues in key areas of reform. China will press ahead with supply-side reform. In this process, we will not shy away from key issues or major problems, and we will seek breakthroughs in key areas. We will continue to streamline administration, delegate power to lower government levels, strengthen regulation and improve services. We will continue to build better "hardware", namely the infrastructure. At the same time, we will make greater efforts to improve our "software", such as shortening the negative list for market access. We will also accelerate reform relating to state owned assets and enterprises, and we will foster a private sector-friendly environment and make every effort to ease the bottlenecks facing private companies. and promote the sound and steady development of the multi-tiered capital markets. Second, China will tackle external challenges by improving its opening-up layout. Against the headwind of unilateralism and protectionism, China is keeping its door open to the world. We have provided access to more sectors, optimised the opening-up layout and sought to advance domestic reform and development through opening up. Going forward, China will further increase market access, open up more sectors to wholly foreign-owned companies and provide a level playing field for domestic and foreign companies alike. The Belt and Road Initiative is the master plan for China's opening up. At the end of this month, the second Belt and Road Forum for International Cooperation will be held in Beijing. We look forward to working with friends from all countries to make sure that BRI projects are of high quality. In particular, we wish to see strong participation from the UK, and we stand ready to engage the UK in deeper and more substantial cooperation on BRI. China will also work hard to increase import. Later this year, we will host the second China International Import Expo. British entrepreneurs are welcomed to take part in the Expo and bring their products and services to the Chinese market. Third, China will make vigorous efforts to increase the level of opening up. In 2018, China took the initiative to cut tariffs a number of times. As a result, average tariff was brought down from 9.8% to 7.5%. greater ease for doing business in China. China's opening up will reach a higher level, and this will in turn promote higher-quality domestic development. By adopting the new Foreign Investment Law to protect the legitimate rights and interests of foreign investment, China displays its resolve and confidence in deeper reform and greater market access for more foreign investment. Last but not least: Where is China's foreign policy going? Is China's development a challenge or opportunity? Is China a partner or a competitor? I think the answer lies in Xi Jinping Thought on Diplomacy. Understanding this Thought is the key to seeing the direction of China's foreign policy. This year's "Two Sessions" reaffirmed that Xi Jinping Thought on Diplomacy offers the basic principles and guideline for China's foreign affairs in the new era. First, in the interest of the common good for all, China will work to build a community with a shared future for mankind. This is not an empty slogan. It is a principle that guides the concrete actions of China's diplomacy. At the end of last February, I attended a panel discussion in London hosted by the Concordia Africa Initiative, and had an in-depth exchange of views with the other panelists on international cooperation in Africa. Debate shed light on truth. The panel discussion has strengthened my conviction that China-Africa cooperation is the best example of building a community with a shared future for mankind. and no selfish political gain from the investment and financing cooperation with Africa. Moreover, China-Africa cooperation has been aimed at meeting the needs of African countries, improving their capability of independent development and providing a better life to African people. Such cooperation is open to all countries in the world. This fully reflects the values of building a community with a shared future for mankind. This ideal is based on the pursuit of the common good for all. It meets the aspiration of people all over the world for a better future. It will gain the recognition of more and more countries and people. Second, China will pursue peaceful development through win-win cooperation. As China grows, the question of whether China and the US can avoid the "Thucydides Trap" becomes a hot topic. As someone who had worked on China-US relations for many years, I know all too well that in this relationship, both countries stand to gain from cooperation and lose from confrontation. I know that you have followed closely the China-US trade frictions. On this issue, China has followed the principles of mutual respect and equality. We have sought to address the differences through dialogues and consultation. And we have worked to expand consensus for cooperation. Our goal is to promote the steady development of China-US relations based on coordination and cooperation, so as to deliver more benefits to the people of the two countries and the rest of the world. We do not create trouble, but we are not afraid of trouble. We do not undermine other countries' interests or seek sphere of influence. We will not go down the beaten path of Western powers to let China's development lead to hegemony. With the wisdom and hard work of our people, China is capable of blazing a new path of peaceful development – one that features mutual respect and win-win cooperation. Third, China will uphold fairness and justice, and take the lead in the reform of the global governance system. The world is undergoing rapid development, profound transformation and deep adjustments. Reform of the global governance system represents the trend of the times and the aspiration of the people. In particular, reform of the WTO is the focus of global attention. As a participant, beneficiary and contributor of international trade, China supports necessary reform of the WTO. But unlike certain country, we do not advocate "China first" or seek to reinvent the wheel. In the interest of fairness and justice, China opposes protectionism and unilateralism categorically, upholds the rule-based multi-lateral trade system and supports the reasonable appeals of developing countries. Going forward, China will continue to shoulder its responsibilities and work for greater effectiveness and democracy in the global governance system. The Chinese people believe that lessons from the past could show the direction for the future. This year is of special significance to both China and the UK. It is the 70th anniversary of the founding of the People's Republic of China. It is also the 65th anniversary of the establishment of China-UK diplomatic relationship at the level of chargé d'affaires. 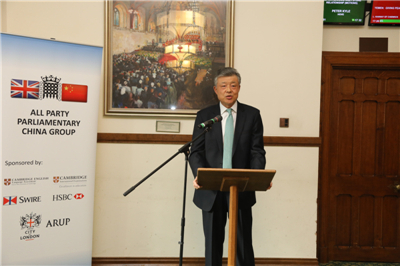 In the past, China and the UK had supported each other in our respective development. In the future, the interests of our nations will remain deeply intertwined and our development goals interconnected. 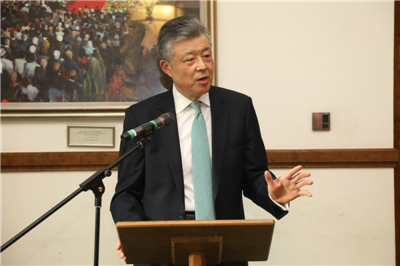 In face of the profound changes in the world unseen in a century, China stands ready to work with the UK to build up consensus, enhance mutual trust and expand cooperation. 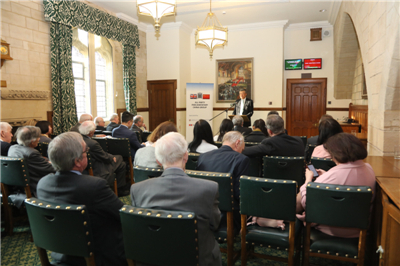 Together we will create a brighter future for the China-UK "Golden Era"! Now I would like to take your questions.